The city of Anuradhapura which was once a major civilization center is now a captivating picturesque place of historical and religious interest. Most tourists are fascinated by the various ruins of Stupas, temples, palaces, reservoirs and many other buildings. The city of Anuradhapura flourished a 1300 years as the political and religious capital of Sri Lanka. The capital of Anuradhapura was abandoned in 993 AD after a heartless invasion. The city which was laying hidden in the jungle until the British rediscovered was restored with a population of 40,000 in 1870. 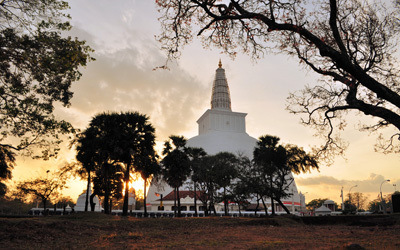 At present, Anuradhapura has abundant places of both historical and religious places to visit. Jaya Sri Maha Bodhi is one of the oldest trees in the world which was brought to Sri Lanka by a Buddhist nun called Sanghamitta which was also the tree Lord Buddha attained enlightment. Today, the Buddhist worshippers and followers from every corner of the world visit the Sri Maha Bodhi which has become a sacred relic. The tree was planted about six meters above the ground and the roots are covered by walls for its protection. Followers also tie vows to branches of the trees hoping for the betterment of life. Considered as the largest Stupa (Statue of Lord Buddha) in Sri Lanka, built by King Mahasen during 273-301 AD is probably the largest stupa in the world. The Stupa enshrines a part of the sash of Lord Buddha. The compound where the Stupa is being stated spreads over 8 acres. The stupa is about 400 feet tall and consists four flight of steps each side the stupa. The courtyard is serene and peaceful letting anyone who wishes to spend sometimes at their own pace. The statue is located in Mahameunawa Park which is a popular site of sculpture and religious value. The statue resembles the meditating Buddha sitting with crossed legs and upturned palms. Samadhi statue which is 8 feet tall is made of granite entirely and is a wonder to followers and worshipers. The statue also symbolizes Dhayana Mudra. The posture of meditation of this Statue is a popular (Aasan) in the learning of meditation. Also known as the “Brazen Palace”, resides close to the Jaya Sri Maha Bodhi. The palace was built by King Dutugemunu and the building was 400 feet long. The name “Brazen” was derived from the fact that the roof tiles used in construction was pure Bronze. The palace consists of 1600 stone pillars with 40 rows each with 40 pillars. The plan is believed to have been a vision from the heavens which took King Dhatusena six years to complete its’ construction. Later the entire palace was destroyed during the reign of king Saddatissa. At Anuradhapura, these tanks are considered as one of the most amazing specimen bathing tanks. These pair of tanks are built close to the Abhayagiri Vihara and the larger tank is 132 feet while the other is 91 feet long. The garden that separates the two ponds is 18 and half feet long. Cut granite slides are placed at the bottom of each pond. The magnificent wall that surrounds these ponds are joined with beautifully decorated flights of stairs. The scroll designs that paves the way to the ponds are an exquisite piece of work. Apart from the above, the sacred city of Anuradhapura behold the vicinity of many other ruins. Some of the other popular ruins from Anuradhapura include, Isurumuniya, Kiribath Vehera, Naka vihara, Sela Cetiya, Dakkhina Stupa, Magul Uyana, Lankarama Buddhist Vihara and Mirisawetiya Vihara all of which possess equal attractions in terms of, historical value, stone carvings, archeology and religious view.